Priyanka Gandhi Vadra’s debut speech in Gujarat was top of the news charts Tuesday, although “chaos in the Congress” (RepublicTV) with defections in Maharashtra, Gujarat and possibly Bengal, were gleefully pounced upon by TV news. Prime Minister Narendra Modi has been missing from the headlines since Sunday’s announcement of elections — this only sharpened focus on Congress’s woes on channels like Times Now, India Today and RepublicTV. And so Republic TV devoted three hours to discussions on Rahul Gandhi: his claim “Bharat Mata Ki Jai” was a Congress slogan, the Congress in disarray with defections and alliance faultlines, and his use of “Masood ji” in a speech. On India Ahead, there was mayhem after anchor Sourav Sanyal bemoaned the absence of political debate on “real” issues instead of Rahul’s “Masood ji” remark. First, Tauseef Khan, TMC, argued that BJP used such trivialities to divert attention from Nirav Modi and demonetisation — stories that broke over the weekend and on Monday. Then, Communist Party of India (Marxist)’s Fuad Halim claimed that Nathuram Godse was the “first terrorist” of India but people called him Godse ji. On India Today, anchor Rajdeep Sardesai discussed if Priyanka Gandhi Vadra could change the narrative for Congress. The front pages are a patchwork of election news — Congress, Bharatiya Janata Party (BJP), and Trinamool Congress (TMC) all make appearances. However, “In late-night move, India grounds Boeing 737 Max” takes the lead in The Times of India and The Indian Express, while Hindustan Times continues to supply “Pulwama proof” with “Speeches, cyber trail…” in its second lead. TOI’s other lead is an “exclusive” interview with BJP president Amit Shah — “Only Modi majority govt can ensure nat’l security: Shah” — this continues in a full page spread inside. “In Modiji, we have given India a ‘mazboot’ leader under whom India has emerged among the top economies… Who can secure the country is another big issue. He is best equipped,” the report quotes him saying. The Congress Working Committee meet in Ahmedabad and Priyanka Gandhi Vadra’s debut rally speech, Tuesday, feature in all newspapers with different focus points: in their headlines, The Hindu and HT highlight the party meet, TOI and Express, the Gandhis. TOI’s “Gandhis sound poll bulge…” leads with what the “Gandhi family” said at their poll rally. “Attempting to change the political narrative post-Pulwama terror attack, the Gandhi family targeted Prime Minister Narendra Modi over unemployment, failed poll promises and the Rafale deal in his own backyard on Tuesday,” writes TOI. 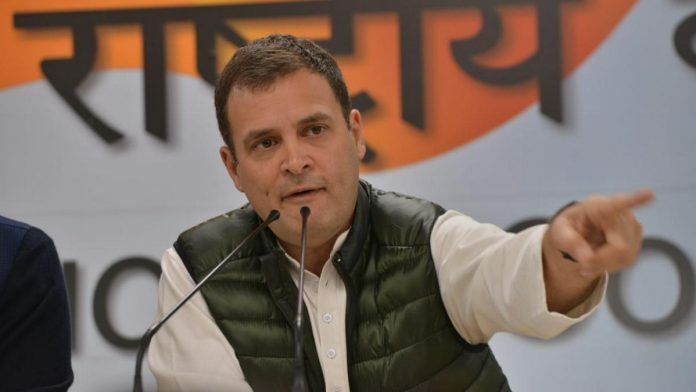 “Telling leaders of his party not to feel despondent by the strident nationalism pitch of the BJP post the Balakot air strike, Congress president Rahul Gandhi Tuesday urged them to take the fight to the rival camp while targeting Prime Minister Narendra Modi,” it writes. TMC also makes it to the front pages for giving 40 per cent of its seats to women candidates. “By giving 40% of the seats to women candidates, Mamata Banerjee outdid her Odisha counterpart, Naveen Patnaik, who had announced 33% seats for women,” writes TOI. The significant news of Mayawati ending “any possibility of the Congress becoming a part of the anti-BJP alliance in Uttar Pradesh” doesn’t make it to the front pages, except in The Hindu. Amar Ujala and Dainik Bhasker lead with Priyanka Gandhi Vadra’s Ahmedabad speech. The Pollachi sexual assault case and the government handing over the case to CBI, makes the front page – A four-member gang was arrested for the alleged sexual harassment of several women in Pollachi. Election issues lead the editorials: Hindu analyses simultaneous assembly elections in four states, Express argues that NCP leader Sharad Pawar’s exit from the polls is a warning to dynastic politics. TOI’s “Wanted, Allies” urges Congress to “walk the extra mile to become the fulcrum of the opposition challenge” to the BJP. Thus far, the Congress “poll battle is somewhat listless” and “piecemeal”. To overcome the BJP “electoral juggernaut” it needs “smart alliances” — citing Uttar Pradesh, Karnataka, Bengal where it has been “dragging its feet”, Congress must “yield” to potential partners “even play second fiddle”, argues TOI. HT’s “An Uphill task for EC,” is sceptical of including political parties social media platforms in the Model Code of Conduct to curb fake news — “…fake news goes beyond political parties” and can any measure “adequately monitor the gigantic Indian Internet user base” which exceeds 500 million?’’, HT asks. While social media companies want to “maximize time and engagement” on their platforms, “it is unlikely political parties will have either the means of inclination” to crack down on fake news, it concludes.